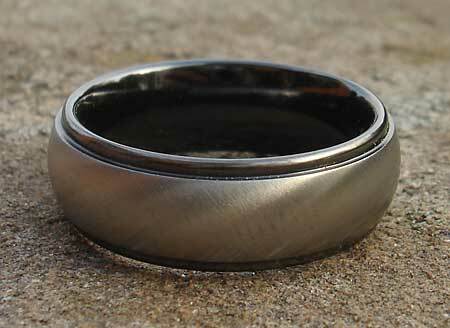 Domed Two Tone Wedding Ring For Men : LOVE2HAVE in the UK! 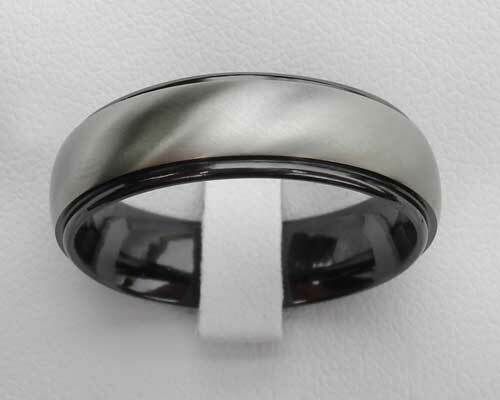 A domed shoulder cut profile wedding ring for men that features a natural grey zirconium centre with shiny black shoulders. The domed grey area is another example of a relieved black that comes with a silky satin finish. The available widths range from 4mm all the way to 12mm. With the introduction of zirconium as another metal to create UK made wedding rings, men's jewellery has gone through a mini-revolution this decade. Our zirconium rings, therefore, make great wedding rings for men with their two-tone styling and hard wearing properties. Finish(es) Available: Polished and satin combination.